Man, we are going to be roughing it! Adding insult to injury is the weather. Today, it’s sunny and 80 degrees. Tomorrow and Saturday? They’re forecasting rain and 60. But are we even considering canceling the reservation and postponing the trip? Not a chance! Mostly because I bragged on Facebook about what an “outdoorsy” guy I am. To let a little drizzle stop us now would be downright embarrassing. So we’ll shoulder on and muddle through and bring rain gear and layers of warm clothing and just hope for the best. I’m more worried about the kids. Not sure how they’re going to survive without internet service. They live on their phones and computers. Audrey’s got an iPad, for heaven’s sake. When I was her age I had a clunky old Walkman…and I was thankful for that! “We’re going to be living just like the pioneers!” I told them reassuringly, carefully skipping over any mention of the Donner Party. Besides, we’ll have two coolers full of food and will be back in a couple of days, so I doubt we’re going to have to resort to cannibalism on this trip. As romantic as that notion sounds, “just like the pioneers” isn’t really a selling point. That lack of internet connectivity is just the tip of the iceberg. No air-conditioning, no SUVs, no Breaking Bad. No, thanks. This city boy is happy being a city boy. In the 21st century. Yesterday I picked up a temporary one-day fishing license for Rusty. This will be the kids’ first foray into fishing, and I’m hoping they have fun. By some lucky twist of fate we were having spaghetti for dinner last night, affording me the perfect opportunity to discuss how to bait a hook with big, fat, juicy and slimy night crawlers. The way Audrey was staring at her pasta was priceless. Regardless of the weather and any sort of squeamishness on the kids’ parts, I’m sure this weekend will be lots of fun and one big adventure. Coincidentally, tomorrow also marks the one year anniversary of my solo road trip. Apparently June 22nd is synonymous with hitting the road and starting an adventure. I find it hard to believe that an entire year has gone by since I pointed my car east and started driving. I remember the near-manic sense of excitement I felt in the hours leading up to my departure, and the constant jubilation I experienced with each click of the odometer. It was definitely one of the best two weeks of my life, and a part of me wishes I could turn back the clock and relive it again. But then I think about how much happier I am today, and how much fuller my life is, and I realize that I wouldn’t trade this in for anything. The trip was a blast, sure, but it was also a temporary escape from an annoyingly humdrum reality. Plus, Tara and I were friends then – we even talked on the phone a couple of times during my trip – but we were still just friends. The good stuff wouldn’t happen for another two months. I really, really like the good stuff. So, off we go! I hope to regale you with tales of adventure and intrigue when I return. If I survive to tell about it, that is. Did I mention there are “vault toilets” there…? Not only will it be an adventure, it’ll be a FUN adventure! We’ll have our beer gloves, horseshoes, and rain gear. ‘Nuff said. Oh, wait…I don’t like beer. Never mind. But you did have me at FUN anyway, so it’s all good. (Plus I’ll have gin. Lots and lots of gin). Okay, I’m dying hear/read all about this faaaaabulous adventure when you get back. I bet you’re gonna have a BLAST! And honestly, the rain wouldn’t bother me because I really like rain. Gosh Mark, I can hardly believe it’s been a YEAR since you took your solo trip because I remember it like it was yesterday! I’ll be leaving for two weeks on Monday, so I’ll catch up on your posts when I’m in Florida. I want to wish you guys an AWESOME adventure this weekend! Have a great time, Pioneers Mark and Tara! P.S. oh, and don’t forget TOILET PAPER and HAND SANITIZER!!!! Don’t get me wrong: I love rain, too. It’s just sort of funny that we’ve had two warm, clear days and that’s all about to come crashing down just in time for our trip. But this is the Pacific Northwest and we’re used to that around here. It’ll be a blast! And yes, we’ll have tp and hand sanitizers AND…most important of all…baby wipes! Enjoy your trip to Florida, my friend. Looking forward to hearing about it when you return. Good news is the toilets are covered…better than going behind the bushes and maybe getting a rash along there somewhere. Oh! Another good thing is that with that weather you are supposed to have, the bugs will be-gone!! Woohoo!! Can’t wait to hear all about it! Next week. When you guys come up!! Either the bugs will be gone, or they’ll all be hanging out in our tent in order to escape from the rain. We’ll see you in just a few days, Tracy! I’m perfectly content with the nearest tree when it comes to peeing. Anything else though, and I’m-a gonna want that terlet with the door! )… yes it got its own comment. Parentheses are important! As a grammar nazi, I couldn’t agree more. Thank you for closing the loop! 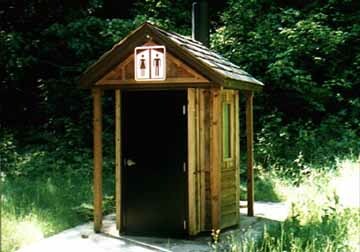 So as I am looking at the picture of the outhouse it reminds me of a recent news story. A man woke up early in the morning he decided to leave the outhouse door open to admire the morning view. However, he got a little more than expected and was attacked by a black bear. I’m glad you told me this. I’ll be certain to bring along my can of pepper spray every time I visit the outhouse. Be ready! The bear pulled the unexpecting camper right off the John and dragged him into the bush. Could you imagine? I do love me some Spanish moss, so we’ll have to wait and see how this works out first. Wait…are there real toilets in the bayou? I am alum North Miami Senior High ’67, home of the Fighting Pioneers. No mountains or forests though. Miami Beach. just for the record…REAL camping doesn’t include the amenities. wimp. Amy!! Long time no hear. Thanks for stopping by. You can still camp in Florida, though I’m sure the experience is quite a bit different there. LOL. We did, and you’re right, we didn’t.